Present your special one with a gift that suits their specific taste. This extensive guide features thoughtful and personalized gifts for all types and budgets. 1800 Tequila recently released a line of special edition bottles all adorned with Keith Haring artwork. Of the six available designs, Untitled (1982)—which features a man clutching his heart—seems like the most appropriate. These porcelain fortune cookies, handmade by Wisconsin-based artist Kim Oaks, are screen printed with Chinese patterns. Each figurine, available in blue or red, arrives with five blank fortunes, so the gifter can jot down little love notes before slipping them inside. The Write Stuff: There are so many reasons you love your Valentine. Pick one from the six options inscribed on these hot pink pencils. Help your partner up their selfie game with photos that would even put Kim Kardashian to shame. This protective phone case features a rim of battery-powered LED lights to help illuminate the subject's face in even the dimmest scenarios. Bake your loved ones some delicious (and photogenic) cookies with these camera-shaped plastic cutters. The set includes three shapes: SLR, TLR, and Rangefinder. Express your feelings with the most romantic of all the internal organs: the heart. The large plush toy, from I Heart Guts, is 11 x 9 inches and arrives with an educational tag that lists facts about the heart. This silver ring looks like a DNA helix wrapped around your finger, making it perfect for anyone with a love for genetics. Score points with your loved one by gifting these bottle openers featuring wood taken from actual Major League Baseball bats. The openers come with a special card detailing the game and team relevant to the bat. Help your partner track all their games with this organizer. The 52-page book has space for 118 tickets stubs. Memorialize the iconic lines between Han Solo and Princess Leia with these decorative hand towels. They make a great gift for anyone who likes to express affection in Star Wars references. The next time you and your significant other decide to stay in for a movie night, relax in matching Star Trek PJs. The two-piece pajama set is available in red, blue, and gold. Real flowers die, but video game flowers are forever. This flat 8-bit bouquet never needs watering, and looks great on a desk or hidden amongst a group of real flowers. Comparing your love to the connection between Ash and Pikachu is high praise. These cute cards are blank on the inside, so you can include your own personalized Poke’puns. Say ‘I love you’ in the most romantic language you know: binary. This paperback book comes with activities, games, and Valentine’s Day cards to hand out to friends. Finally, you can tell your significant other: "You R2 Good to Me!" These matching keychains are just regular LEGO pieces when they’re apart, but together they make a heart. This kit is great for anyone who wants to star in their own comic book. The set includes pre-formatted blank pages, an instructional booklet, and even helpful tips. Once your giftee has finished their story (maybe a retelling of how you two met), they can place it in the included envelope and slip it into the mail. In return, they'll receive a professionally-bound copy of their original comic book. As this mug fills up with a hot liquid, its pixilated heart decoration fills up as well. With full life (and a full cup of coffee), your loved one can take on anything. Whether you’re in a long distance relationship or spend a lot of time on business trips, Rabbit helps keep you connected. The video chat application lets you watch videos, play games, and online shop together. Rabbit makes Netflix night easy, even if you’re in two different states. That means no more counting down on the phone before pressing the play button. Triby was designed for families, but it’s great for live-in couples as well. You can make free Internet calls between the device and connected smartphones. You can also use it as a shared speaker to play music or a messenger to send doodles and notes. These cufflinks are equal parts stylish and functional. The rhodium-plated 16GB USB flash drive will let your partner keep precious information right on his or her sleeve. This sentimental kit lets your partner know that you want their dreams to flourish. Each container has a different meaning—from love to strength—and symbolizes specific hopes and dreams the planter might have. The flowers' growth symbolizes that the gardener’s dreams can grow as well. Don’t settle on a boring glass vase when you can give flowers this year. This personalized flower holder is made from stoneware clay and resembles a tree with your initials carved into it. Remember Chia pets? The planter company has added Emoji-shaped products to their stock. This heart-eyed planter arrives with packets for three plantings and might just be silly enough to be a hit. Instead of settling on a boring bouquet of roses, get them what they really want: a bunch of tiny cats. This fun gift comes with nine plush kitten toys connected to removable stems. Help your partner show off their puppy love with this necklace. Each dog-shaped pendant—available in a number of dog breeds—comes with a tiny heart punched out. You can also add a personalized engraving on the opposite side. Why give your loved one jewelry when they can just make it themselves? This kit comes with pliers, wire, beading pad, stones, beads, and more, to help the user make the perfect collection of accessories. This keychain comes with silver- and gold-plated nuts on a brass key ring, perfect for the handy person in your life. Add a personal touch to your Valentine's kitchen with this cutting board featuring your names. Now, your loved one will think of you every time they’re prepping a delicious meal. Treat your special someone to something extra sweet. Customize these delicious dessert squares with a photo of you and your partner or a picture of something significant to your relationship. The treat is available in various flavors like chocolate peanut butter, birthday cake, cotton candy, and more. Make baking more romantic with a special rolling pin that imprints heart shapes into the dough. Heart-emblazoned sugar cookies have never been so easy to make. These fake oyster shells are made of chocolate, so they can be wrapped and eaten later without smelling like the ocean. Oysters are known as an aphrodisiac, after all. Not only is this romantic pendent shaped like a stack of books, but each book opens up into its own locket. That means there’s room for three times the amount of cute photographs. If a necklace isn’t your Valentine’s style, rings are a nice alternative. The book-shaped ring opens up to reveal two circular spaces for pictures. This fake book is actually a cleverly hidden jewelry box that can store the recipient’s earrings and various trinkets. It has four “pages” that can hold up to 44 pieces of jewelry. Sharing is caring. These socks, resembling blank library cards, are sure to delight any book lover. Celebrate your love for your phone and for a relationship where you can comfortably sit in silence, with this card made by illustrator Emily McDowell. Let this pillow do the talking for you on Valentine’s Day. The soft Emoji pillow is about 13 inches wide, perfect for hugging when you're not around. Did you know that otters hold hands while they sleep? The cute little mammals would probably text each other hearts too, if they could work a phone. This handmade sterling silver necklace is less than an inch tall and comes with your choice of chain length. Fans of the hit British drama Orphan Black will love this officially licensed ring. The jewelry is a replica of the one worn by Cosima and spells out the code "324B2." Mimic the love of Daenerys and Khal Drogo of Game of Thrones with these matching mugs that feature their pet names. Let’s just hope your relationship works out a little better. Celebrate his or her love for Parks and Recreation with these handmade earrings. If Leslie and Ben aren't your Valentine's favorite duo, the jewelry is also available with photos of Leslie and Anne, or the entire cast. 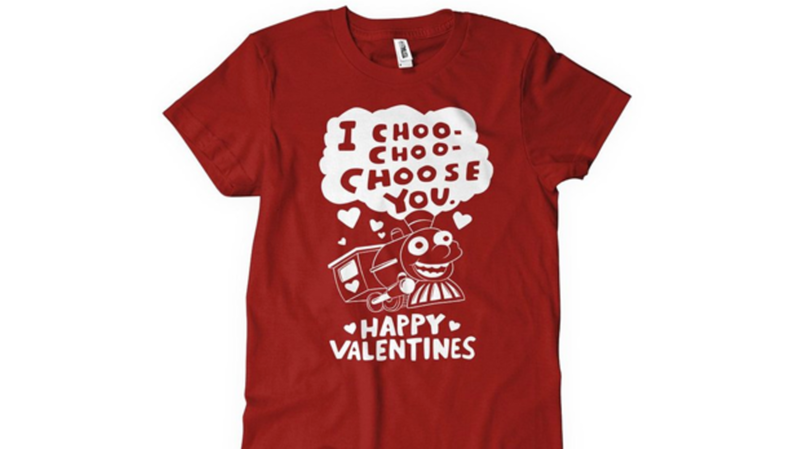 This shirt is perfect for any fan of The Simpsons. It references a last minute Valentine that Lisa gave Ralph, but you can give it under more romantic circumstances. This Evil Twin beer is a crafty expression of love. “…This stout is like a metaphor for freedom - the sum of all the beauty that surrounds me and my perfect contemporary existence,” the brewery’s founder, Jeppe Jarnit-Bjergsø, says. This beer is a lot cheaper than a pearl necklace, and it's brewed with real Rappahannock River Oysters. Luckily, the beer tastes more like chocolate than seafood. With all that beer, your Valentine is going to need a place to put it. This set of Pilsner glasses can be customized with a tree and a couple's initials engraved on the side. Make it extra special by adding the date of your anniversary inside the heart. Picnic baskets are nice, but they don’t always travel well. This backpack promises to keep your stock secure on the journey to the perfect spot. The set includes a blanket, stainless steel utensils, plates, cotton napkins, wine glasses, a bottle opener, salt and pepper shakers, a cheese knife, and even a plastic chopping board. With dedicated pockets for every item, the exterior is sure to keep everything in its place and easy to find while the insulated interior keeps the food cool. Immortalize a special time and location with these customizable, sterling silver cufflinks. Pick any location that’s significant to you, whether it’s the location of your first kiss or your first apartment together. This 4 x 4 inch creative design features a heart created from maps of two different locations, one for each member of the relationship. The maps come from recycled atlases and the white background is recycled card stock. Trading places: These custom state keychains are great for couples who live in two different states. The lightweight aluminum keychains come with heart trails linking the two locations together. Sure, CDs and Spotify playlists rule today's music scene, but the mixtape still holds a lot of romantic nostalgia. Send a personalized love note with this customizable rubber doormat that lets you feature a band or family name in the title line. But that doesn't mean mixtapes are completely out of style. Give your partner a slightly more high-tech version with this case. Upload your playlist onto a USB flashdrive and then pop it into this special cassette-shaped case. The kit even comes with a sheet of paper to write the songs down. It may not hold all the charm of a real mixtape, but it definitely holds a lot more songs (900 to be exact). The basic principle of music theory, the "circle of fifths," gets a classy upgrade with this ring. The handy piece of jewelry is perfect for the beginning musician. While composing their next masterpiece, the wearer just needs to rotate the sterling ring to find the right key. Sure, gift cards are not the most thoughtful present, but at least you can add a little romance with this heart-shaped packaging.